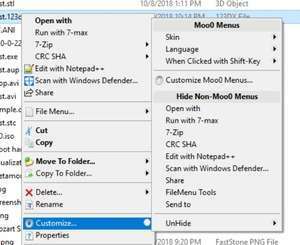 Moo0 RightClicker is a modification to Windows Explorer and replaces the right-click menu inside Windows with its own context menu which has been reshuffled. When install, Moo0 RightClick changes the sort order of items in the context menu, adds items and possibly removes items. Some of its additions include move and copy files to other folders, adding favorites, permanently delete, change folders, command prompt and more. The program is free but is crippleware as the free version does not allow for customization. Version 1.56 is a freeware program which does not have restrictions and it's free so it doesn't cost anything. For security reasons, you should also check out the Moo0 RightClicker download at LO4D.com which includes virus and malware tests. Additional screenshots of this application download may be available, too.